Concealed zippery and blanket: this creative design and fantastic quality would make a wonderful gift. 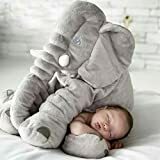 This pillow’s coziness, warmth and comfort will make your little one feel safe, relaxed, and right at home. They will want to take it everywhere with them and will look forward to having a restful sleep or play. Through our rigorous testing and verification,this organic PP cotton comes from no chemical dyes and dyeing, non-polluted soil, non-GMO and no herbicides. We always pay attention to the detail of the product.It is created with unique designs and the highest quality child safe filling materials. It is skin-friendly for your children and family. This large stuffed soft pillow is perfect for snuggling! Material: 100 % PP cotton Filling. Contribute to the child’s ability to innovate and intellectual development. Pleasing voice can stimulate the baby’s hearing ability, The bright color can stimulate the baby’s observation ability. 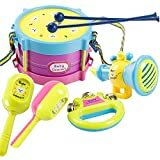 Develop your child’s interest in music and rhythm with this five sets of musical instruments band kit. Six set consists of 2 maracas, 1 drum with 2 drumsticks, a horn and a rattle. 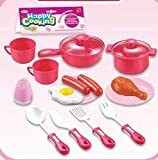 Suitable For Age: For Kids Above 2-3 years old.